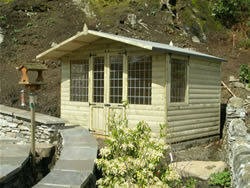 Since its inception, Himley Garden Buildings has become synonymous with the words Quality, Service and Reliability. This is further backed by our comprehensive 5 year guarantee. Each building manufactured goes through a rigerous selection process. This includes the hand-selection of raw materials, through to final delivery and erection inspection. Having craftsmen work on just one building at a time, you can be assured that years of dedication and pride is built into every building.